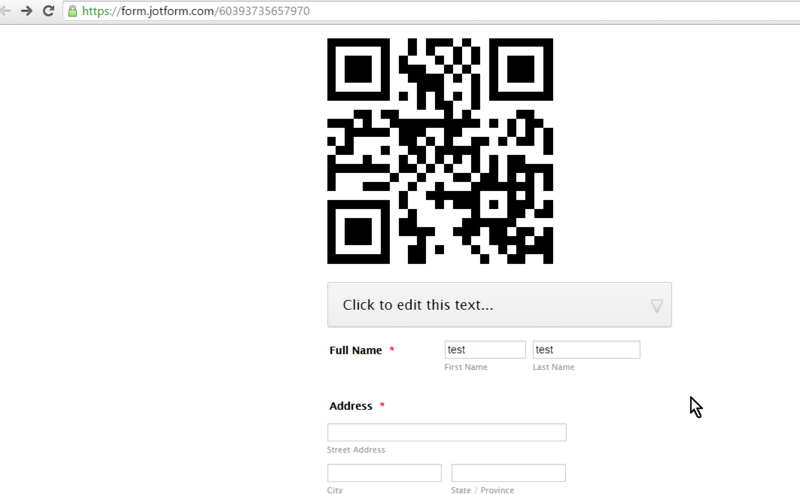 I checked the Dynamic QR code widget, it seems like it is broken even if it is not placed in the form collapsed field. Here's my test form: https://form.jotform.com/60382084470958. It does not show in the live form and on the submission itself. There's also an error in the browser console which indicates that there is indeed a problem. I have forwarded this to our developers to have it checked and fixed. We will update you as soon as the problem has been resolved. Apologies for the inconvenience. 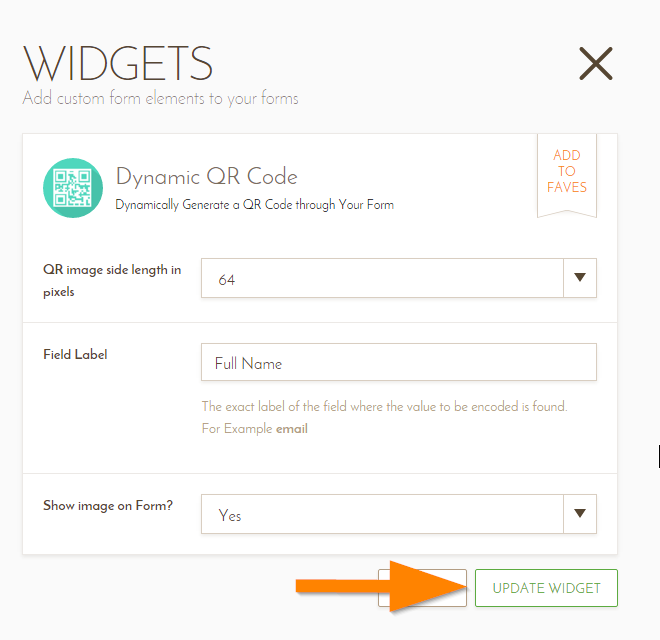 The widget has been updated to fix the issue - please re-integrate it to apply the update. Please correct ASAP. JotForm has been great so far! Have you tried opening the widget and clicking the "Update Widget" button? I cloned your form and you have inputted "Code" in the "Field Label". However, there's no text box that has that label name. Perhaps you were trying to associate the QR code in the Coupon code? Is that what you are trying to do? I tried to associate the QR code in the "Full Name" field. 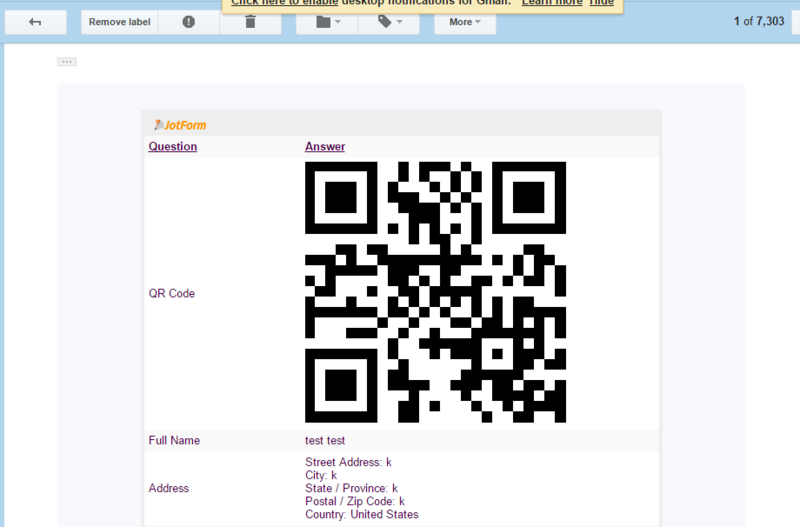 When you type on the full name field, the QR code is generated. In my test notification, I was able to receive the QR code image. That was it! I will link it directly to "Full Name". Glad to hear that it worked. I have opened a separate thread for the other concern that you have, that will help us discuss it better. Please refer to this link instead: http://www.jotform.com/answers/768081. We will address it accordingly. Thank you. If I clone the demo page, without making any changes. I get the QR code in preview. However, if I specify an other field, like "E-mail", which is on the demo form, the QR code disappear. If I restore to "Coupon code", the QR code does NOT reappear. If I try to use in one of my forms, I get no QR code. I thought I was doing something wrong, but the situation with the cloned demo page certainly shows otherwise ... I think. The other possibility I was thinking of is that some of my field labels are with a few French characters (ex: é, è, ...) But that does not seem the case. Short of my profile not being the default English. Looking forward to enlightment as to what I am doing wrong. To better assist you, I have opened a separate thread for your question. Please refer to this link instead: https://www.jotform.com/answers/797887. We will address it shortly. Thank you for your understanding. Wait ... it seems to work ONCE data is entered into the field being read. Doh ! My bad. I was expecting to see something even if the field being converted to QR was empty.